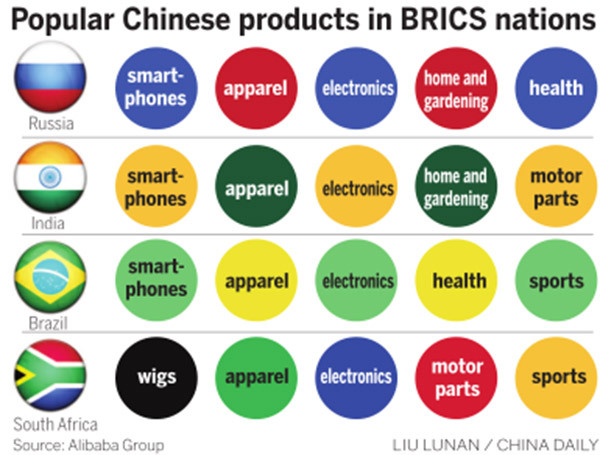 E-commerce is set to prosper among the BRICS countries and become a major link connecting their residents, according to a report by Alibaba Group Holding Ltd.
By 2022, gross merchandise volume generated via online shopping portals will skyrocket 340 percent from last year to reach $3 trillion in Brazil, Russia, India, China and South Africa, the research arm of the world's largest e-commerce platform, Alibaba, said in a report released on Tuesday. That figure would represent 59 percent of global e-commerce transaction value in five years, up from 41.8 percent a year ago, according to AliResearch. Meanwhile, the number of online shoppers is projected to nearly double from 720 million last year to 1.35 billion in 2022. That means an expanded share of total online shoppers from 47.2 percent to 61 percent. Cross-border e-commerce among the five nations will also gain traction, with transaction volume predicted to jump six-fold to $553.6 billion in five years, accounting for 41 percent of sales generated from the entire cross-border shopping network. The report found that the Chinese people are increasingly drawn to Russian candies and cookies, Indian handicrafts and spices, and Brazilian pine nuts and propolis, as well as grapefruit and wine from South Africa. Meanwhile, customers in the four countries are most attracted to Chinese apparel, mobile phones and accessories, and consumer electronics, according to data from AliExpress, an Alibaba export subsidiary targeting overseas buyers. AliResearch attributed the foreseeable e-commerce boom to the maturing IT infrastructure, the prevalence of smartphones, and enhanced payment and logistics capabilities. For instance, AliExpress has been the biggest cross-border shopping site in Russia since 2014, according to researcher TNS. Its popularity is largely thanks to improved logistics efficiency by working with local vendors. "Using algorithms and realtime analysis, we have cut the average delivery time from up to a month to just four days in Russia, and we plan to achieve 72-hour delivery in five years," said AliExpress General Manager Shen Difan. Mobile payment is also picking up quickly in India as the country's largest e-wallet operator Paytm supports smooth mobile transactions and is on course to introduce a money market fund, a payment bank and a credit scoring system, similar to the architecture of China's Alipay.